World War I might have been finished nearly a century but in regards to an Australian vessel sunk by a German mine off New Zealand the hostilities are just hotting up. 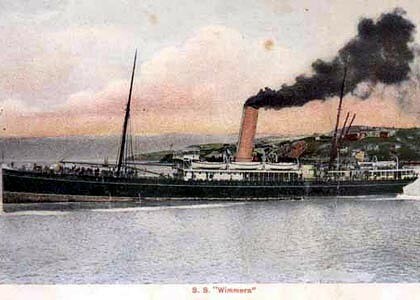 The row is over claims made in the New Zealand media this week that a search by a team using underwater imaging technology found the wreck of the Melbourne-owned SS Wimmera that went to the bottom in 1918, costing the lives of 26 of the 151 on board. The find was claimed to have been made on Friday after a four-day search off New Zealand's extreme northern tip by Auckland electronics developer Mike Hodson, whose company funded the two-vessel expedition. It was claimed to have been made possible by his company's main product, a multibeam underwater sonar system called 'WASSP', which it developed and market worldwide. But Auckland amateur historian Mike Fraser, who spent years researching the ship's sinking, including getting German naval records about where their ship laid the mines, was angered by the claim. Mr Fraser, who was on one of the vessels in the expedition, said all that was found was a blip on the sonar which could have been an underwater reef and that the truth of the claim could only be verified by a diver. "Hodson's got no idea about finding shipwrecks, he has just come in and taken over this search as a means of promoting his sonar system. He would not let anyone use other technology, he was rude to everyone on the trip. I was so angry I could have hit him."